It's easy to tell that you're obsessed with good food when you plan a trip around where you want to eat. It was perfect timing that Emeline was ready to go home from UDel for Christmas when Charlie and I needed a ride home from D.C., and I knew that we were destined to stop in Philly for some cheesesteak. Why mess with fate? I'll tell you, I researched the best place to get cheesesteaks for like a month before the main event. I wanted to avoid Pat's and Geno's, just like I avoid Katz's in NYC, but besides that I needed a little direction from those in the know. A few enquiries later, Tony Luke's it was. 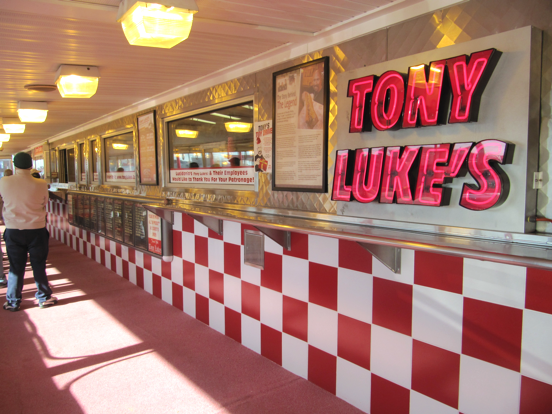 Tony Luke's is located in South Philly right next to the I-95, very close to all of the sports stadiums of the city. The area is semi-industrial and strip-club laden, so upon arrival I knew I had made the right choice. I read a lot of great things about TL's roast pork and broccoli rabe sandwich, so we resolved to share one pork and one cheesesteak between the three of us. I had been having inner dialogue with myself for a week trying to decide whether we would take the plunge and go for cheese wiz on the steak or not, but when game day came, I couldn't pull the trigger. The (gruff) woman taking our order said she doesn't like wiz, so I took her lead and went with american cheese and fried onions. 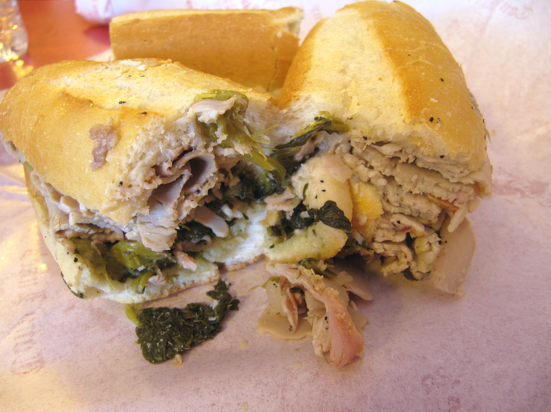 The pork and broccoli rabe above was warm, moist, messy and delicious. The bread had a nice crusty and soft dichotomy going on and the bitterness of the rabe was countered nicely by the pork. The sandwich was quite garlicky which had me panicking for a moment (see: garlic allergy) but thankfully, dangerous lines were left uncrossed. I've read a lot about long lines and wait times at Tony Luke's, but around 11:45 am when we were there we were at the table with our food within about 15 minutes. I think this spot is popular with sports-fans, so it might be good to avoid around game time, unless you love hoards of sports-fans. The near-I95 location is quite convenient and I can imagine this being a dangerous temptation next time I'm on the road in the area. Or on any road in a 100 mile vicinity. I can't compare this sandwich to others as it was my first from the motherland, but I can say that it was damn good and worth a trip to Philly. 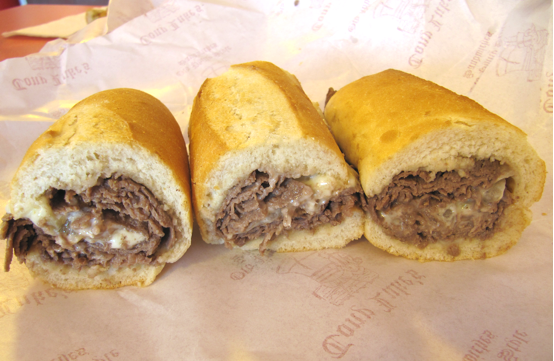 I went to school in the area and Tony Luke's is by far the best cheesesteak. They have the walk up counter on one side of the road and a sports bar across the street. The sports bar can get rowdy with Philly fans, but is a great, relaxed place to grab a great cheesesteak and a beer.